The Energist McCue Ultra VPL, a leading variable pulsed light device, is perfectly suited to hair removal and multiple skin rejuvenation treatments. Competing pulsed light systems are less versatile and less effective than the McCue Energist Ultra VPL. Ultra VPL treatment delivery is fully adjustable. The operator can alter the light’s pulse quantity, duration and frequency. Lasers generate intense heat. The skin needs to be pre-cooled. The micro-pulsed light emitted by the Ultra VPL renders skin pre-cooling unnecessary. Your patients remain comfortable; more importantly, the therapy is more effective, because the blood vessels in the skin have not been forced to constrict during a pre-cooling process. VPL is superior to laser therapy for treating veins and rosacea. McCue’s Ultra VPL has become a gold standard among non-laser hair removal tools. It is safe, non-invasive and effective on both males and females of skin types one through five. Melanin readily absorbs pulsed red light, which heats the hair. When the heat reaches the base of the hair, it damages the follicle, handicapping its ability to generate new growth. Hair soon separates from the damaged follicle and falls out. SunrayLaser.com has just received an Energist Ultra VPL. Please contact one of our senior consultants to discuss how variable pulsed light can bring new patients to your practice. The U.S. Food and Drug Adminstration has cleared McCue to market the Energist Ultra VPL for numerous uses, including hair removal and acne vulgaris. 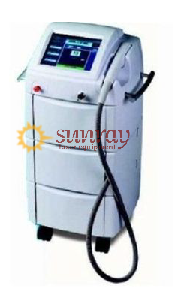 SunrayLaser.com is the web’s best source for refurbished aesthetic medical devices. We have earned a strong reputation for meticulous device restoration and quality aftermarket service. Our technicians have tested this previously owned device; we guarantee it to be in perfect working order. Although the Energist Ultra VPL is not easy to source on the refurbished market, we are offering an excellent price on the system. Please fill in the short form below and tell our team how to contact you. We are always happy to discuss how our full range of refurbished dermatological devices and medical lasers can bring you new patients. Of course, we will be happy to provide a price quote!